Can I substitute Fiery Wall of Protection Oil for Special No. 20 Oil? Special Oil No. 20 contains a blend of oils for Love, Money, Lucky, Protection, and Personal Power. Fiery Wall of Protection is a form of protective herbal recipe that sets up a barrier so that those who try to cross it get zapped. Because Special Oil No. 20 is an all-purpose blend, we might substitute it for other oils -- but not the other way around. 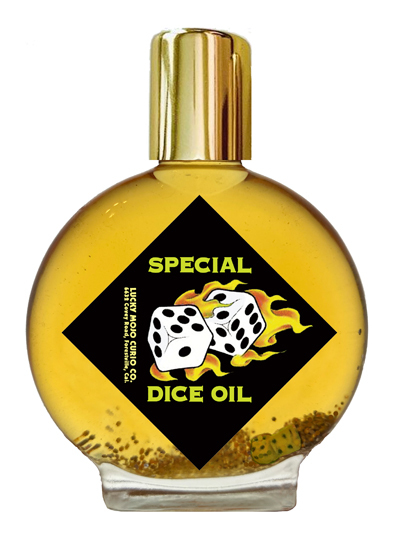 Special Dice Oil, with Tiny Dice in the Bottle, 2 oz. Yes you could substitute Fiery Wall of Protection to dress a candle with if that candle is for protection, in fact it would be better to use Fiery Wall the Special Oil no.20 for protection. Now for the what Special Oil no.20 is usually used for, that is dressing candles for almost any good perpose no you can't use Firey Wall for that. They are two very different formulas for two different things. Special Oil no.20 or wick oil is used to dress candles that are ment for good things,money,love,or luck drawing. Fiery Wall of Protection is a potent formula for well, protection. Is it a matter of strength? They are both good, but Fiery Wall is usually when someone is working magic against you and protection is general protection. Fiery Wall of Protection and Protection are two entirely different recipes. Protection protects you from all manner of accidental and deliberate bad stuff. Fiery Wall of Protection is used when under threat of attack, and it causes those who are attacking you to get "burned" when they ross the line. Can the two be worn and used together? OnlyMyself wrote: Can the two be worn and used together? Sure, they are a great combination. I just love LM's firey wall of protection oil, and as this site says, understand that it is for continued protection against crossing and/or spell work from others. However, I began wearing this oil during the work week, and at the end of the day I find myself more at peace and completely unaffected by the hustle and bustle, stress and anxiety of the commute and work place (far less moody overall). It made me realize how much stress and negativity I was absorbing from my environment(s) that wasn't inherently mine, which beforehand I had no idea. I know I am a sensitive person who can absorb energies from my environment like a sponge, but had no idea how much I was absorbing until I began wearing this oil to/from work. My workplace (a small size law firm) really makes me wonder though - the people I work around come off as nice and very pleasent, although there are stressful times because we are expected to produce such a high level of work and things get very disorganized, but if I have to protect myself w/firey wall of protection while amongst co-workers, I'm questioning whether the pleasant demeanor is all a facade? Azna21 wrote: I just love LM's firey wall of protection oil, and as this site says, understand that it is for continued protection against crossing and/or spell work from others. However, I began wearing this oil during the work week, and at the end of the day I find myself more at peace and completely unaffected by the hustle and bustle, stress and anxiety of the commute and work place (far less moody overall). It made me realize how much stress and negativity I was absorbing from my environment(s) that wasn't inherently mine, which beforehand I had no idea. I know I am a sensitive person who can absorb energies from my environment like a sponge, but had no idea how much I was absorbing until I began wearing this oil to/from work. Of course it is a facade, no one could work if we did not put on pleasant demeanors. I would back up the Fiery wall of protection with good spiritual cleansing in a 13 herb bath. Thanks for the idea about wearing Fiery Wall of Protection oil to work. This oil has a strong smell. Does anyone have any ideas on how can I mask it to go to a scent-free workplace? Unfortunately, things that would "mask the smell" would likely be equally, if not more, problematic in a scent-free workplace. Have you considered using the Firey Wall of Protection bath crystals, either as a spiritual bath, or mixed in with the laundry? This method of application is quite effective for laying down personal protection, but results in less smell than applying the oil. Thanks ELKnap, I will have to order some crystals for my laundry. Its amazing I followed your example Azna21...but with different results. It seems that my eyes were opened to some of the underhandedness in my office. I also sprinkled stop gossip which seemed to open up gossip that I would not otherwise know. But I will not stop using it because I know its effectiveness. To my knowledge fiery wall of protection is good against all types of evil intent by individuals, including evil spell casting. Now my question is whether or not spell casting is the same as laying down tricks. Reason why I am asking is because I want to know if fiery wall of protection has the same protection capabilities as fear not to walk over evil, as far as does fiery wall protect only against evil spells and people but not laying down tricks? My reading has told me that laying down tricks goes as far as putting down things for people to come in contact with and what not. Spell casting can be done from a remote location. So I was wondering, again, if fiery wall can do both or do i have to get fear not to protect me against tricks. i jus had 2 post this, but i really do believe the fiery wall of protection oil protected me from the law the other nite. the police took my 2 friends to jail and not me. i felt bad bcuz the police wasn't as hard on me as they were on them. maybe it was just a coincidence, or maybe it WAS the oil. i dn't kno but I BELIEVE in conjure, as for my friends...they dn't. 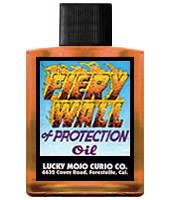 Fiery Wall of Protection is specifically geared to offer protection when people are working against you. It will work for you whether your enemy lives next door or in another country. I have used Fear not to walk over evil for more general purposes. For instance, if you live in an area where there may be a lot of hot footing and cursing going back and forth between neighbors, FNTWOE would be an appropriate formula to use, it protects you even if you are not the specific target, and it is a specific protection against hotfooting. Laying down tricks and spell casting can be used to mean the same thing by root workers, but to be honest, most professional workers I know, don't speak of spell casting, they talk about getting the job done. Fiery Wall of Protection is a fabulous formula and I highly recommend it too, pecantan! so can FNTWOE protect you even if you are a specific target and not just to protect against "crossfire; can it also protect against people who are, lets say for example far away and want to cast some type of curse or "spell" or anything along those lines? shyguy wrote: so can FNTWOE protect you even if you are a specific target and not just to protect against "crossfire; can it also protect against people who are, lets say for example far away and want to cast some type of curse or "spell" or anything along those lines? OK, I do not work for Lucky Mojo and I do not help them make their products, so my ability to answer this is limited. But I would not use FNTWOE in the way that you are describing OR if I did want to use it I would use it in combination with Fiery Wall of Protection. Fear Not kills a jinx or a trick that has been laid down on you, Fiery Wall of Protection creates a Fiery Wall around you to ward off enemies and the tricks they might try. thank you bri for the information, i sincerely appreciate the time your taking to answer my questions. I think I will go with the fiery wall just to be safe, and someone also recommened to me on another post that I use silver dimes annointed with fntwoe for that kind of protection. Can i use indian head pennies? Only because i thought that dimes were used as a sign of being crossed not to protect but they could I guess. What is the difference between these oils Fiery Wall of Protection and Saint Michael the Archangel? There are certain herbs that are associated directly with St. Michael, and they would be included in the St. Michael formula - whereas the Fiery Wall wouldn't necessarily be formulated to have the direct herbal correspondence to Michael. St. Michael oil is usually used to work specifically with the Arch Angel. Fiery Wall of Protection oil can be used with St. Michael work for protection or by itself to anoint your home, yourself or any other space where you would need protection. Just got a small order of oils in and I am beyond excited! I got Fiery wall of protection,commanding oil, and cast off evil oil...OH! I also got some kiss me now oil and I can't want to use them! I'm going to try some commanding oil out tonight! I'll be back to let you all know how everything worked out! This stuff is good stuff...I love love love the smell of it, it's so rich and earthy. I have been using this oil on my car and myself before driving because I don't drive well! I say a little prayer for my car and myself to be protected from danger and for others to be protected from us!So far I find myself dodging accidents like crazy! I live in Los Angeles with a lot of uninsured crazy drivers so for me to be dodging three and four accidents a day gives me the confidence to relax a bit behind the wheel. The true test came when I had to take my mom to the store,usually she would be jumpy with anyone other than herself behind the wheel but she seemed to be really relaxed and calm which is not normal for her.After I parked and we got up stairs she told me I did a wonderful job =D. Fiery Wall is in my top 3 for amazing fragrance. Then again I'm a sucker for spicy-woodsy bouquets. It also works fantastically well and I wouldn't be without it! My very first order to LM requested LM Fiery Wall, LM Crown of Success and Vanvan.LM Fiery Wall is a "must have on hand"!! I just set mine up this past Sunday, and let me tell you, just holding it filled me with this sense of calm and peace. Every time I hold it in my hands and pray to it, I feel like I'm being gently rocked in a safe body of water. Also, I've been petitioning St. Martha to help me with a long-lasting habit (stress/emotional eating), and it seems that although there's definitely been movement with her assistance, once I activated this mojo bag, the symptoms have all but dissipated. Maybe it has something to do with feeling safe. At any rate, the bag is working wonderfully, and I love the combo of the sky blue bag with the tiny skull charm! So glad to hear it's working well for you. For a while, I had felt frustrated to the core.I could not find a much needed photo for a very particular spell that Cat had recommended. I had been searching everywhere to the point of frustration and exhaustion coming up empty handed with each search. I wasn't feeling very hopeful about ever finding this evasive pic. 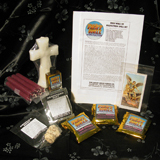 Then my other half and I picked up Lucky Mojo's Fiery Wall of Protection Kit. I knew we needed serious protection. I doubt there are many of us,if any,who can do without it, however, I did not expect such huge nor speedy results. Three days after completing the spell I found the photograph. I know I jumped up and down while singing and dancing about the pic. This was an unexpected gift and that is an understatement!!! Fiery Wall of Protection is one of my favorites. Great testimony! This weekend the East Coast was hit with a massive blizzard. My son had to work during the blizzard and drive on one of the most dangerous highways In our area during height of the storm. The night before the storm I annointed all sides and tires of his vehicle with FWP oil and prayed to St Micheal for protection. I am thankful that he came home safely and missed the pile up on the highway that had people stranded in the blizzard for hours! That is pretty awesome. I am glad that St. Michael worked on your behalf, and Fiery wall. ...and that is just one of "The Ways" Fiery Wall of Protection works. That's a ditto on this end Mysticserver, I dressed a family member's SUV with Fiery Wall of Protection as he had to drive through that weather in the South East US. He has lived all over the world and in many countries where the weather can brutal, so when he says the weather is bad, it is. He made it safely to his destination, too. Yay i get to write another testimony. First i would like to thank St. Michael for all his wonderful and amazing blessing he has shown upon me. I am most grateful. Now the woman doesnt know i am posting about this testimony as of right now .. but i want to extend her gratitude for her to Ms. Cat for taking the time to make such a exceptionally fine product such as Fiery wall of Protection oil/products. Please feel relieved and joyous that because you have taken it upon yourself in making these products, there is woman out there that no longer endures this abuse anymore. Thank you so much!! Its one of my favorites too and great success story wraithklewn. Great work with St. Michael. I am glad he came through for you as he often does when it comes to domestic violence, stalking, and other means of protection. I hope you continue to work with him to keep this woman safe. In addition, I would possibly do some work on this woman to give her the wisdom to leave this abusive man. Would like to give a short follow up on this success ive had with FWOP. First i send my thanks to St. Michael who im humbly grateful to have a great affinity with, and for his impenetrable defense he bestows to myself and others i had petitioned his aid for. And to of course Ms Cat and the LM staff for making such fine products that we all love and enjoy. This oil if flat out the best protection i use. The woman ive used this work for is still protected and has saved her from many more situations.she also annoints a amulet to keep its protection strong. this guy has been held down and restrained greatly and im grateful that i was there to help a fellow human being from such evil. Now i normally dont root for divorces but the woman is preparing herself to finally be rid of this man for good!! With other works being planned for cut and clear, healing and to be financially stable things are really looking good for her. after that it will be justified works on the pathetic man..and yes its been done as a reading and he will pay dearly for all the evil he has spread to innocent children the woman and others he has wronged against. A friend of mine was accepted into a county police department and is graduating from the police academy on Friday. Throughout his six months of training I kept telling him that he should be assigned to a particular area of the county he will be serving in (we live somewhere else so we are unfamiliar with many of the precincts) No one believed it would happen as most new recruits are assigned to less safe area's. I bought a St Michael key chain for him as a graduation present and used LM Fiery Wall of Protection oil, incense and bath crystals on it along with a nine day novena to St Michael asking St Michael to protect my friend. On the ninth day of the novena my friend told me he was assigned to the area I had been speaking to him about. I have no doubt that this is a sign the work I did on the keychain will provide him with powerful protection! I would like to add my testimonial about the Fiery Wall of Protection Triple Mojo hand I received last week. Since dressing it, this is my experience and what I am learning "true magic" is... I live in Ak, where this week we had an obscene amount of snow. All around me I saw people slipping and sliding all over the roads and going at rates of speed that were dangerous for conditions. As for myself and the people driving directly around me? We were all being smart and no one got out of control... Everyone was playing it safe. I could have easily been stuck in direct contact with one of those people that were in such a hurry they were endangering all those around them, but that didn't happen. I work at an animal care center. When working with animals, it isn't a question of "if" you will be bit... its a question of when. Today was that day for me. I was breaking up a dog fight and my finger got a pretty bad bite. Of course I took the proper precautions to avoid infections, but declined going to the doctor. With the level of bite I received this probably wasn't the smartest move, but I knew that if I saw any danger signs I would go straight to the doctor. With how deep the bite was, I fully expected to be heading out to Urgent Care later today... instead, not only is there no sign of infection, but the wound doesn't even hurt all that much. I am hardly even noticing it. Now... MOST people would look at the first case and figure "coincidence". MOST people would look at the second thing and think "But you got BIT!" But here is how I see it... my mojo hand gave me just that little bit of edge on these icy scary roads to put me around other safe drivers to give me that little bit of extra protection I needed to arrive at my destination safely. My mojo hand also gave me just that little bit of extra protection to make sure that all the items I needed to protect myself from an infection and avoid things getting bad with this bite were on hand, and to know right where to find them when time was of the essence. I got bit, yes. But it could have been SO MUCH worse, and by all accounts SHOULD be so much worse... but its not. And here is what I am learning... TRUE magic, the REAL kind is in the beautiful little moments that flow naturally and you could chalk up to coincidence or "luck". Its just that extra little edge that gives you pause and makes you realize that you really do now have something just a little extra helping you out as long as you are open to it and willing to follow where it leads. Don't get me wrong... I'm still hoping my money hand will hook me up with Publisher's Clearing House! LOL! But as a "glass half empty" kind of gal, I am finding my own magic in the way that my Mojo Hands are helping me see the world. Thanks for reading this, all that you wonderful people on this list have given me means the world! With me and some spitefulness I only used a drop of Fiery Wall of Protection oil in my mojo bag, people became competitive and like the attitude of look at me now Im above you that kind of thing why has this happen what went wrong? I used 1 drop literally. Its like all my secret enemies came out the woodwork and where like haha look at me now and look at you kind of thing. I got this from two family members and two others. Im not horrible to others so I don't know why they would want to jump at an "opportunity" in their eyes to try to compete its weird because Im humble so where is the spitefulness coming from? What was the original purpose of the mojo bag? Fiery Wall of Protection is a powerful protector. Its purpose does not include love and feminine power. You may have protected drawing love and feminine power to you by putting that on your mojo. Depends on what you spoke/prayed when you put that drop of fiery wall on your bag. The fiery Wall, based on your words may be blocking these things. Try to remember what you said as you did this and how you felt at the time. As everyone stated, and as I have found Fiery Wall is very powerful and does not go on that type of bag. It is better to specify one purpose per mojo, rather than expecting one to do everything. I know it is powerful I said bring me protection, while I dropped the oil in, my mistake the bag wasn't for "love" in that sense it was just for more self love. And I wasnt expecting it to do everthing I just put herbs in there that I liked and topped it off with fwop. Should I just get rid of it. Because at that time I did need protection. I didn't want to draw anything to me without protection. Also I think what could of contributed to it was the fact a month before that I did a candle spell to remove someone from my life (the same person I'm protecting myself from) but because this was my first time I didn't dispose of it correctly because now that I disposed of it, Ive noticed that the energy from the mojo bag isn't so angry as it was prior to me disposing the candle. How can I get a reading to find out what is going on. Too much confusion at the moment. I didnt want love just still to be liked while protected, because I tend to have a standoffish aura if I do protection work. Go to http://www.readersandrootworkers.org to browse the AIRR profiles and choose a reader to book with. Or if you're willing to pay a premium for a reading right away, you can call 1-888-4-HOODOO where several AIRR readers are available for instant readings. Either - if you want an email reading, you'll need to choose a reader that offers that service. That also happens with me. I have switched to Peony OIl or Safe Travel if I am traveling. Fiery Wall of Protection is like a guard dog who will bite the mailman if there is no intruder. Perhaps it is perceiving small slights and encroachments that you are experiencing, and standing up to them at an energetic level. Perhaps you are acting very subtly different. Perhaps people in your life are used to you being a powerless doormat, and are responding to the changes in your character. If so, this will go on until everyone is used to the new you. Why not try some Crucible of Courage and Master Oil to make you powerful? Why not try an uncrossing bath followed by a bath of wisdom and mastery? Good luck with the new you and with the oils. Keep in touch. I just bought a large order from LM and accidentally bought Protection instead of fire-y wall, I am putting another order together soon as well ( I order a lot) in the mean time is there anything I can add to make it fire-y wall? My friend just came over and sensed some dark energy in the hallway outside of my room. He hurriedly did a tarot reading to see what was going on (ghosts? a curse from the neighbors?) while I whipped out my Lucky Mojo Fiery Wall of Protection oil..as I applied it to my door and myself he breathed and said "Whew, everything feels a lot better. It really feels a lot different".